There’s much more we want to share with you... please enjoy this extensive collection of wedding highlight films we’ve created for our wonderful wedding couples. 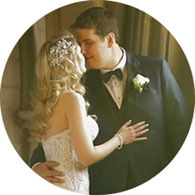 Olivia and Ignat were married in Guelph in southwestern Ontario. Their wedding ceremony took place at Holy Rosary Catholic Church, followed by a warm celebration at their wedding reception in Creelman Hall at the University of Guelph. One of our favorite parts of the day was filming their creative video session. As you’ll see, the bride and groom and their bridal party were very enthusiastic about their creative wedding videography session with us. It made for some beautiful and romantic wedding video imagery! © 2019 Summerfield Films Wedding Videographers Toronto|ProPhoto theme|BY THE DESIGN SPACE Co.